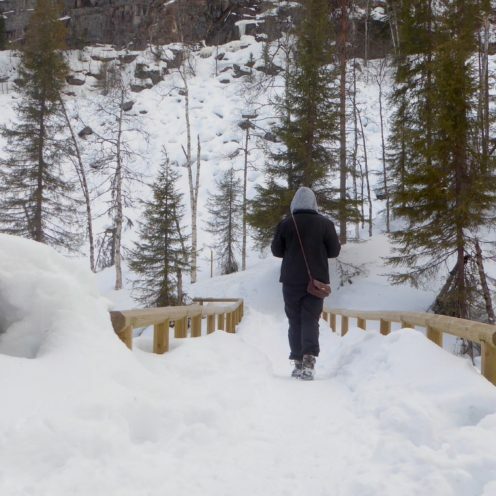 Frozen Waterfalls, Snow Covered Trees and Paths, and a little bit of Ice. 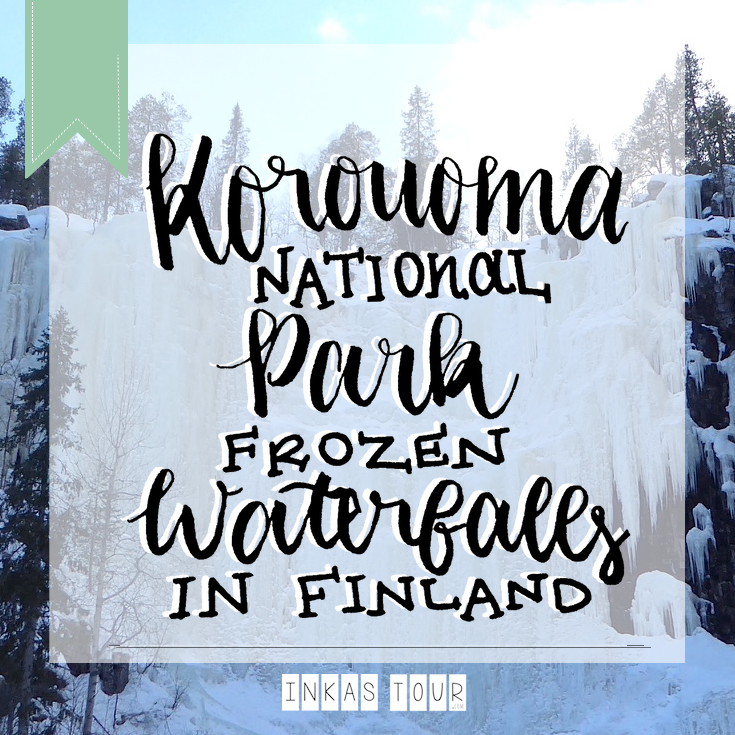 That describes the Korouma Valley or Korouma Nature Reserve and shows just how beautiful Frozen Waterfalls in Finland can be. 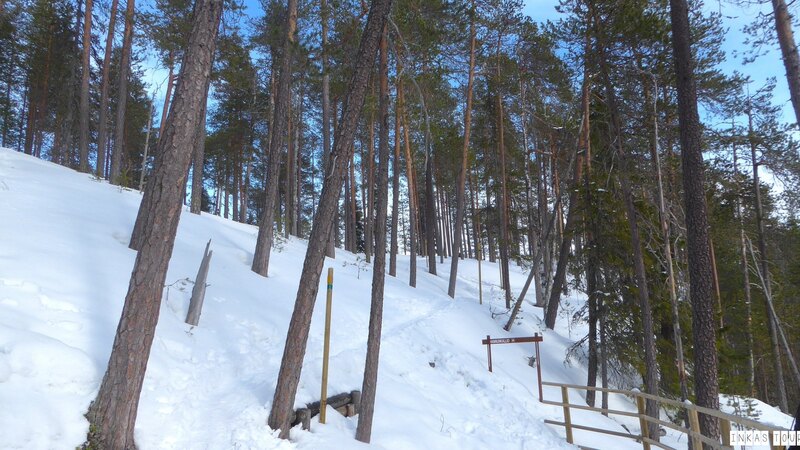 The Korouoma National Reserve is located just outside of Posio, and often offered as a day trip. The Korouoma Valley is about 30 kilometers long, with a 130 m deep Canyon, with the River Korojoki flowing below in the Canyon. 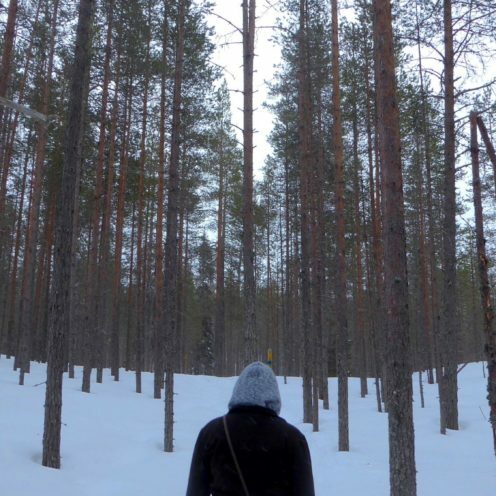 The most popular trail in the Korouoma National Reserve the Koronjää, also know as the best walk to find Frozen Waterfalls in Finland. 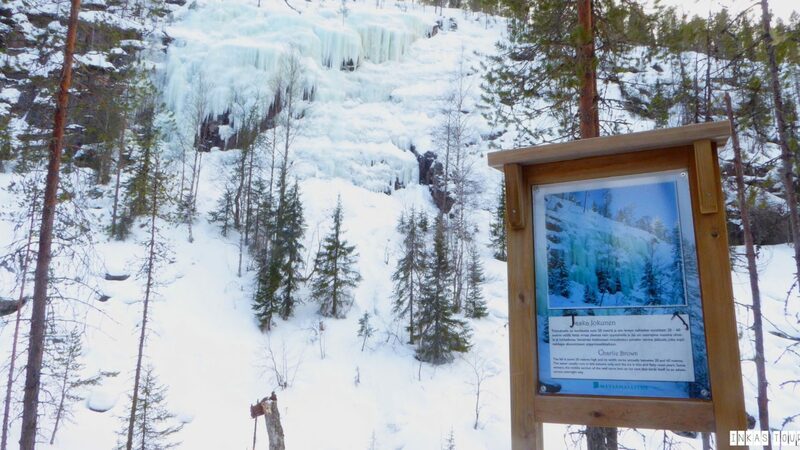 It is a 5km Circular Trail takes you along great views of the Valley and past the three most famous Frozen Waterfalls in Finland. *Spoiler: They are only Frozen in Winter, during the Summer month they will actually melt, believe it or not. 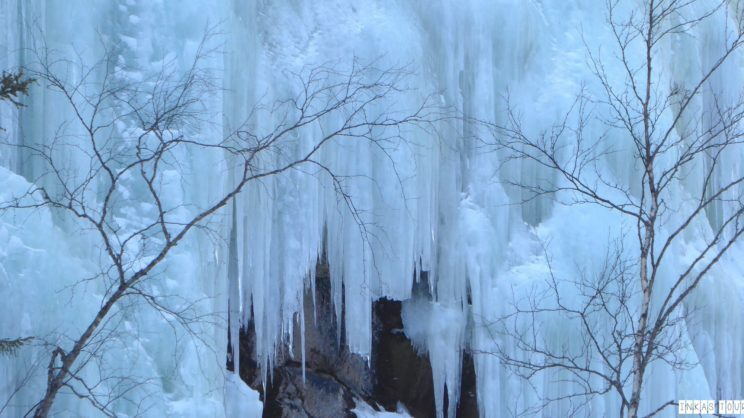 These Frozen Waterfalls are popular among Ice Climbers, have you spotted one? 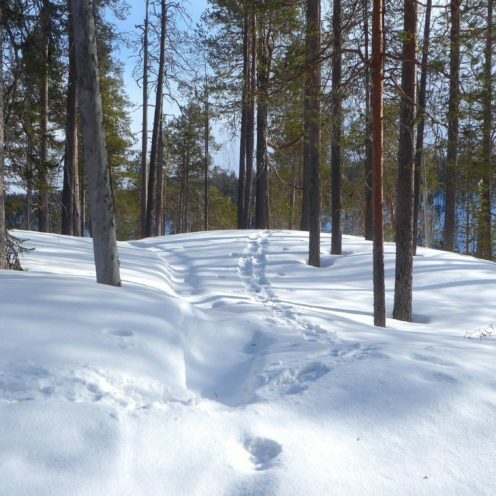 If you are traveling to Finland, and are planning a Winter Hike, PLEASE, Wear proper food wear (the path is snowy and icy at points) but most of all have a little fun and enjoy the Winter Landscapes. Because it is beautiful and absolutely stunning. 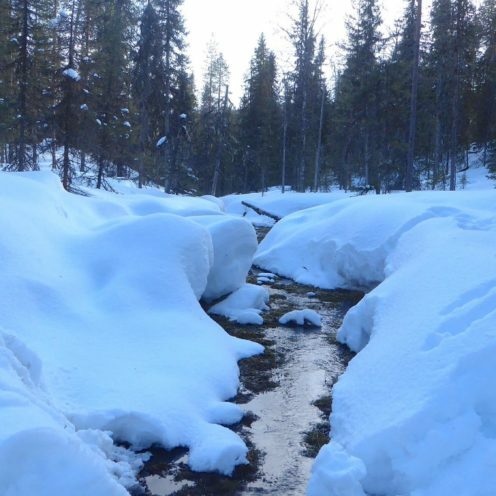 By the River, which you may just get a glimpse of how deep the Snow really is. It should not be underestimated. I don’t know about you but I really hope you enjoy this trail. 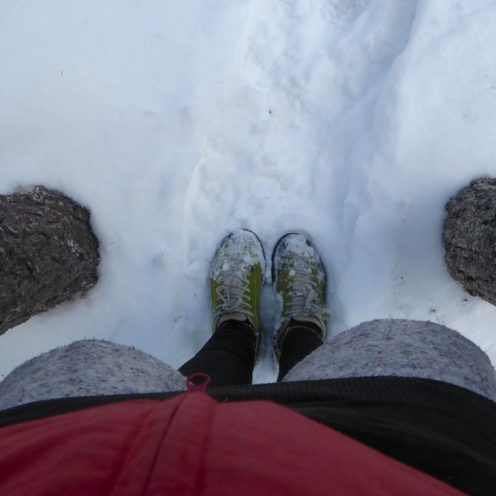 Before reading on I want you to image SNOW, loads of SNOW, Snow Covered Trees, Snow Covered Everything, then throw in a dash of an Ice Chill in the Air, with a freshness in the Air that makes you want to take multiple breaths of Fresh Air. Like you felt you have never experienced, such dynamic, energetic and fresh AIR ever. That is the feeling you will have when you walk along and about this Landscape. 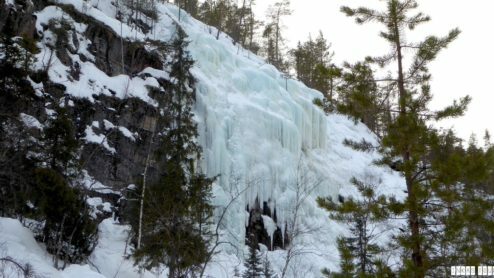 Not only does the Korouoma National Reserve showcase the most beautiful Frozen Waterfalls in Finland there it also has a unique History. In many places along the Korouoma Canyon, you will be walking along what is known as “the old horse road”, which was used by loggers in the 1900’s. 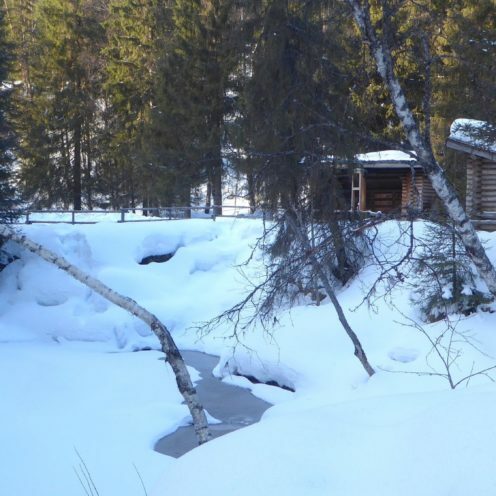 The logs were cut in the winter and transported from the forest by Horse, to be stored along the Streams and Rivers. Once the Spring Floods came, the logs would them float down towards the River Kemijoki and further downstream to the Sand mills. 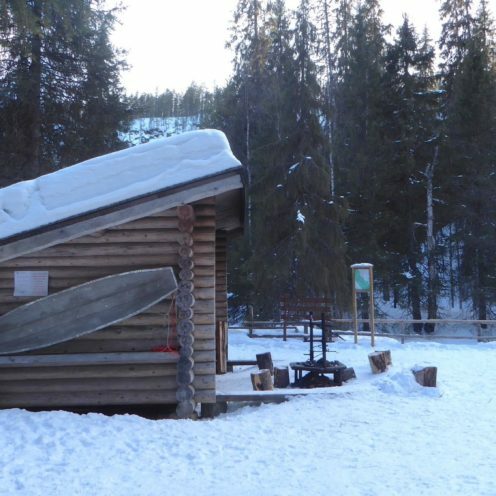 Log floating ended in the Korojoki (the River flowing through the Korouma National Reserve) in the 1930’s, but further downstream it continued for Further Decades. 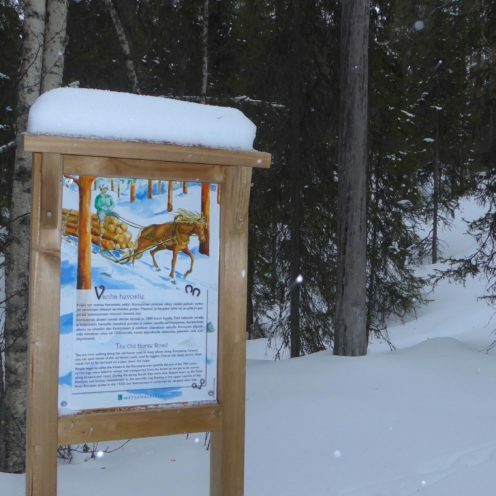 All this beautiful Information and the History is featured on beautiful Illustrated signs along the trail. Have you ever wondered “What was the task of a “ soil man” are”? - Well, you could find out. With some small adjustments, it just shows how adapted the Finish People are to the Weather Conditions. While some countries would likely go under in all the Snow, the Finnish know how to embrace it. When this Trail was still used for Logging they would be building a Road, this needed to have the best track and the easiest route, it required a lot of great expertise, as finders had to explore the Area first, and choose a suitable Route. Dozens of horses would pass along this Road each day, and almost all of them took two loads per day to the forest area. This is where the great innovation and knowing how to embrace the Snow came into action. Pulling the heavy sleighs was hard on the horses, so they created tracks that would match the sleigh runners, and flood these with water. The water would, of course, freeze. In the Summer the whole area would turn into a moist, nutrient-rich habitat for a range of plants. You can find marsh -marigold, wood cranesbills in purple and yellow, and their berries and many more. It is like having the best of both worlds. So my suggestion to you is, what every time of year you plan on going to a place, embrace it. Make it happen and take advantage of it. Heck if you want to do a Snow Angel in the Snow do it like no one is watching. 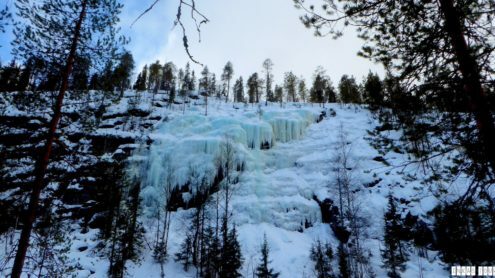 But often small beauties can make such a difference and that is after all why we are talking about Frozen Waterfalls in Finland. Cause they are Beautiful. 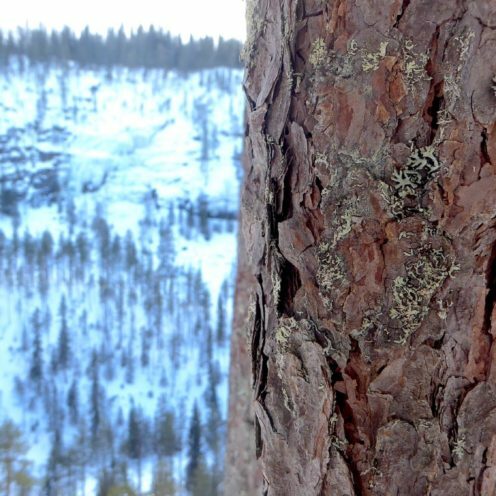 First up: meet Charlie Brown or Jaska Jokunen, when walking around Clockwise you will see him first from a Lookout on the other side of the Valley. He is 50 meters high and varies in width between 20 and 60 m each year. Generally, the Water only run in Autumn the rest of the year it’s icy or flakey. I fell like it does not matter where you walk along the Valley, there is Pure Beauty and Peace all around and the whole way. I wonder if it comes across just as beautiful from your side of the desk, or Couch. Let me know below? What do you feel when you see these beauties. How about the Mammoth Fall or Mammuttiputous? It is one of the most popular climbing spots in the Korouoma Area. 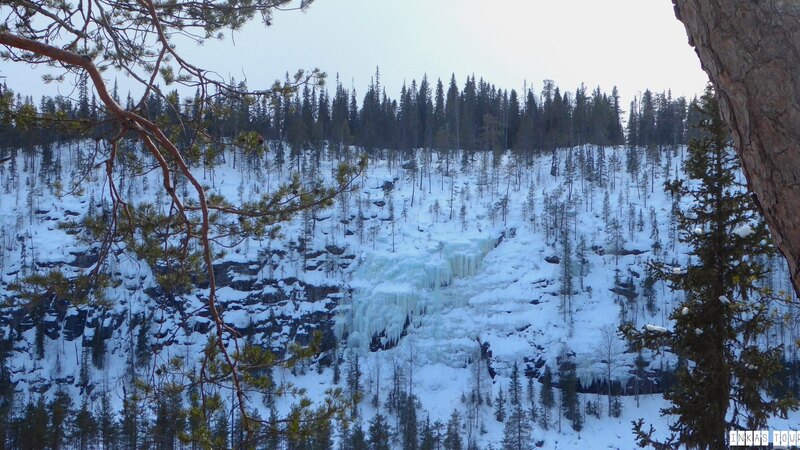 I wonder if it is one of the most popular Frozen Waterfall in Finland for climbing as well? The wide fall offers several climbing routes and providing various routes. the right side of the fall is about 50 meters high, while the width varies from year to year. The Spring Water from the slopes of the Yli-Voho Hill gives the ice the sheer glimmer of blue color. As we come closer to the third and last Waterfall, you might be able to catch glimpses of the River. Take a look at how much snow there is STILL. (People this was April, and it was already becoming a little warmer.) If you can’t quite imagine it yet just take a look at the Bridge. I am being serious if you ever want to see SNOW and more SNOW. You have got to go to Finland. Anytime between November to April and you will have a 98% chance. 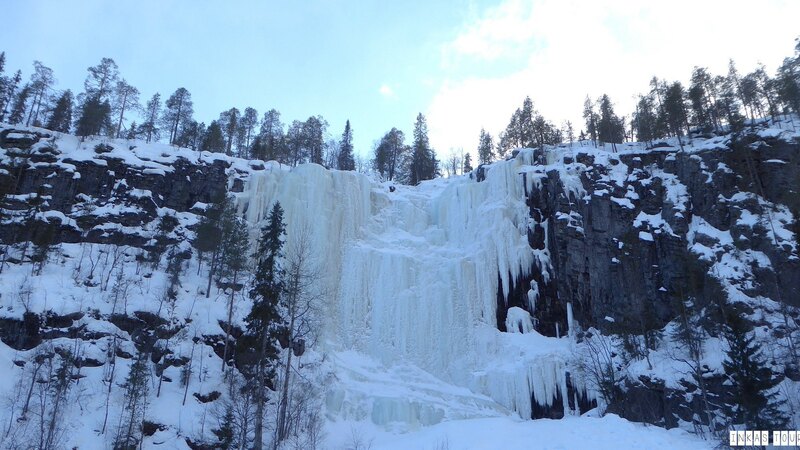 The Largest of the three Frozen Waterfalls is the Brown River or Ruskea Virta. 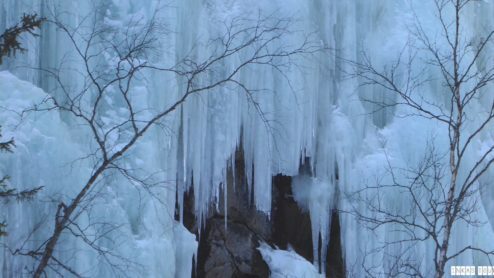 As the highest Icewall, it is even a challenge for some experiences ice climbers. The middle area rout rises to about 60 meters. Throughout the whole period of winter, the Water flow is Strong, while the ice climbing season can start as early as October and November. BU May or June the last bit of Ice will have then disappeared. 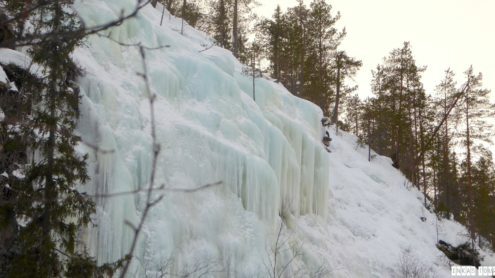 As the highest icefall in Korouoma, it poses a challenge even for experienced ice climbers. The middle area route rises to about 60 meters. 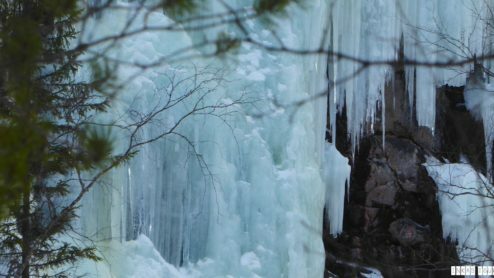 The water flow is strong all throughout the winter, and if frost comes early you can go ice climbing as early as October and November. The last ice usually disappears around May and June. 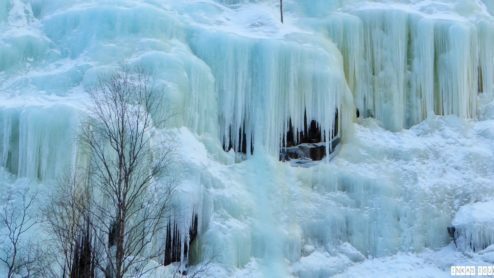 Frozen Waterfalls bring something special like they are almost magical, there is a certain piece of Quiet and pure beauty. 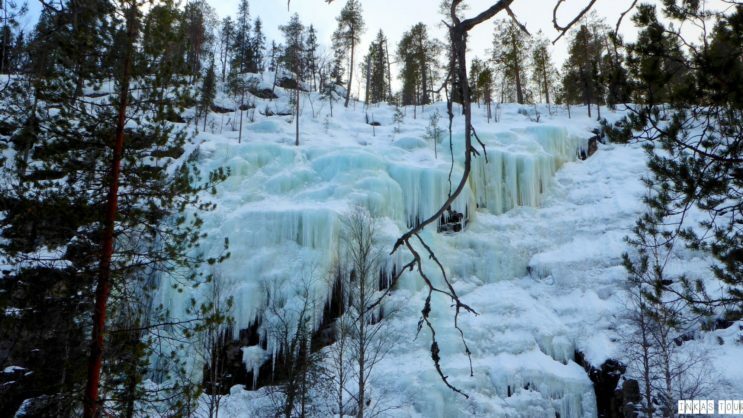 I hope you feel just a little bit the same, and were able to be transported in a Winter Wonderland with these Frozen Waterfalls in Finland. As you are just coming up the bend to go up the last hill, you will come to a Camp. If you are adventures side is large enough why not camp out here for a Night! 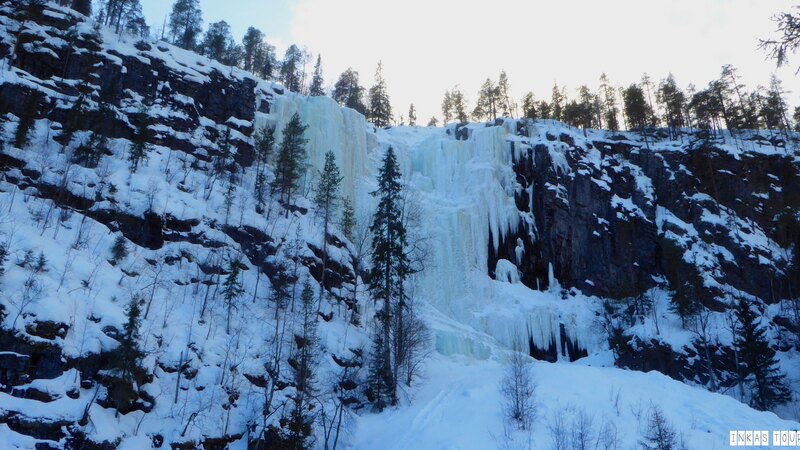 SO, do you have a Favourite Frozen Waterfall in Finland among the three? I must say I like the name, Charlie Brown, while it is the smallest among the three there is NOTHING small about it. Impressive wise the Brown River would have won. So guess it is a tie.